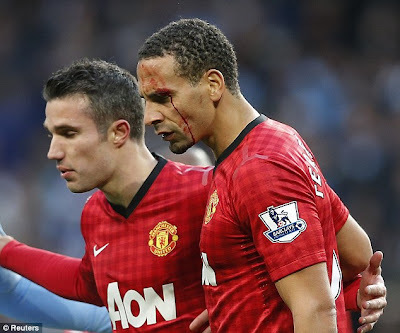 Most Football fans were outraged when Manchester United star Rio Ferdinand was left bleeding after being hit in the face with a two pence coin as he celebrated his team's derby victory at the weekend. However, it seems as if relatives of Chelsea star Ashley Cole were not sympathetic to his plight as they allegedly took to Facebook to gloat about the attack on Ferdinand during Sunday's Manchester derby. Cole's brother Matthew is reported to have said in a post that seeing the defender hit in the eye had 'made his day'. The well-documented tension between Cole and Ferdinand surfaced during the John Terry race trial, in which Cole acted as a character witness for Chelsea captain John Terry after he was accused of racially abusing Rio's brother Anton during a heated game against QPR at Loftus Road. The former England skipper was cleared at Westminster magistrates, but the bad blood between the two camps remains. The Facebook thread was later removed and Sue Cole denied writing anything online about Ferdinand's injury while Matthew Cole was not available for comment. Ferdinand was left bleeding from his left eye following the incident which took place in the aftermath of United's injury-time winning goal in their 3-2 victory at the Etihad Stadium. 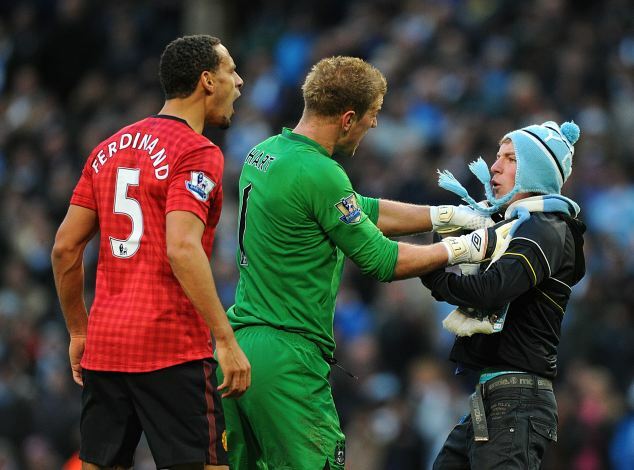 In extraordinary scenes, a City fan then ran on to the pitch to confront Ferdinand but was restrained by Manchester City's goalkeeper Joe Hart. A smoke flare was also thrown onto the pitch.